As you may know, thyroid imbalances can lead to fatigue, depression, stress, and more. But it can be difficult for doctors to assess whether you truly have a thyroid insufficiency. While they have accepted ranges for "normal" thyroid levels, what's normal for you could be very different from what's normal for your neighbor — and you could both be within the acceptable range. But let's say you usually hang out on the high end of the spectrum, and your levels dip toward the lower end. If you go in for testing, your doctor might say that you're fine because you're still in the acceptable range - even though you don't feel fine. And you don't feel fine because you've varied from your own personal acceptable range. If you're at all concerned about your thyroid, find a doctor who will both look at your test results and listen to your symptoms. You'll want to work together to find the right level for you, even if that means taking thyroid hormones despite testing in the "normal" range. But what if you don't need hormones? It happens. Sometime your levels might get just a little bit off. It's not enough to justify hormone treatment, but enough that you don't quite feel like yourself. If only there was a natural solution that could bump your thyroid up just a bit to get you back on track. Good news — there is. Natural medicine practitioners have been using an herb called ashwagandha for centuries to reduce stress, improve cognitive function, promote sleep, balance adrenal function, and treat anxiety and depression. Now, research is finally catching up and explaining why it works so well. According to a study published in the Journal of Alternative and Complementary Medicine, one reason that ashwagandha root extract is so effective is that it helps boost and balance thyroid hormones. This was a double-blind, randomized, placebo-controlled study of 50 people with hypothyroidism, so it was a quality study. 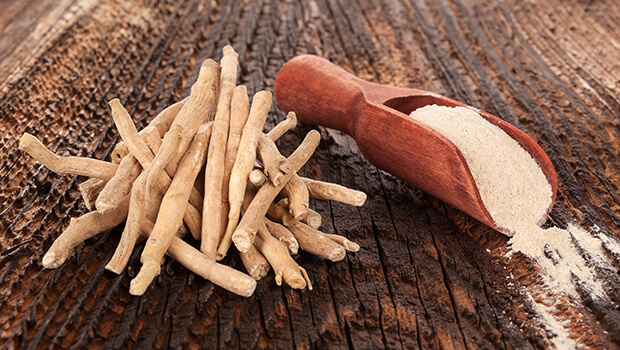 The researchers found that taking 600 mg of ashwagandha a day significantly improved serum TSH, serum T4, and serum T3 levels, moving them closer to normalization by 19%, 45%, and 21%, respectively. This is great news for people who just need a little help to balance their thyroid out. Of course, if you suspect that your thyroid levels are significantly out of whack, you should definitely see your doctor to help determine both what's normal and appropriate for you. You also need to determine whether you need to be supplementing with thyroid hormones. Sometimes, prolonged periods of stress can throw many of our hormones, including thyroid, a bit off track. If that describes you, I strongly recommend that you give Advanced Stress Relief a try. It contains several herbs and nutrients that can reduce stress and help manage your cortisol. One of these herbs is ashwagandha. I think you'll find it helps reduce your anxiety and gives your hormones a chance to recover. A.K. Sharma et al. "Efficacy and Safety of Ashwagandha Root Extract in Subclinical Hypothyroid Patients: A Double-Blind, Randomized Placebo-Controlled Trial"? Journal of Alternative and Complementary Medicine <http://dx.doi.org/10.1089/acm.2017.0183>?? Published online ahead of print, doi: 10.1089/acm.2017.0183.